Women have specific health issues that require a high and consistent level of comprehensive health focus. From sexual health to lifestyle management and everything in between, women can access our three medical platforms for all their health needs. HomeMD is a patient-centered health care service that starts with a simple download of an app. Our platforms include video conferencing, home visits and a clinic located in mid-town Toronto. Each is staffed by qualified, knowledgeable NP’s (Nurse Practitioners) who are licensed to diagnose and prescribe for most medical issues, as well as perform Pap tests, STI screening and treat menopause and pelvic health concerns. Many minor health concerns can be addressed quickly and efficiently with a quick video conference from your device. Telemedicine is the future of health care — statistically, it’s shown to effectively resolve about 70% of ailment queries and treatment advice. Convenient telemedicine through secure virtual consultations leads to better outcomes and results in quality time and quality care. More comprehensive concerns can be dealt with via a home visit or at our clinic, located in mid-town Toronto. 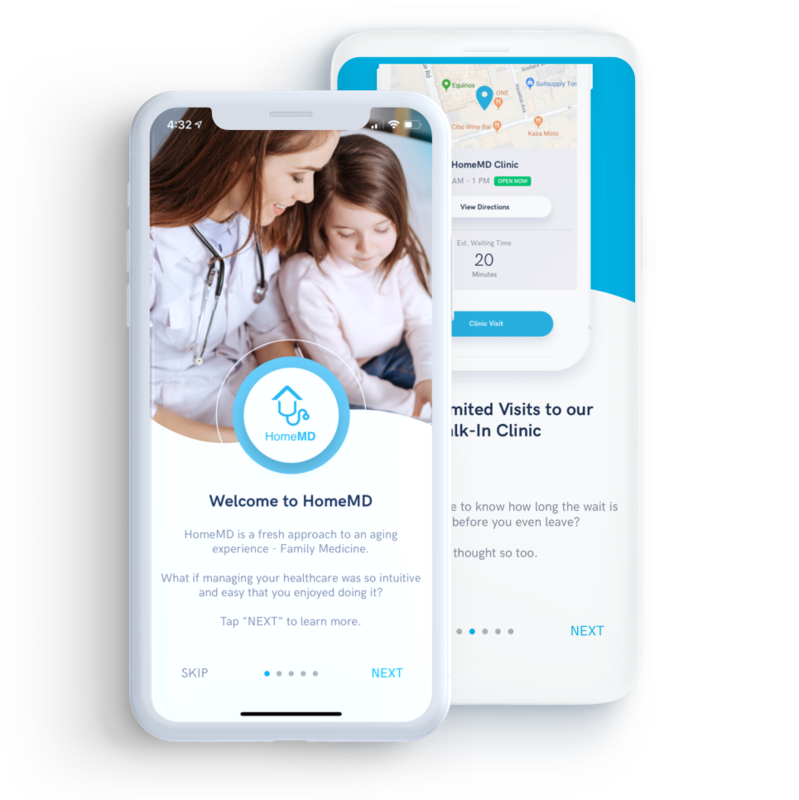 HomeMD is a digital-first primary health care service with a human touch that offers medical professional web chat, house calls and same-day clinic visits, all through HomeMD’s unique app. Join our All access plan, and you will receive unlimited access to medical video consultations, as well as our other platforms, including medical home visits and clinic visits. Preventive care is a hallmark of quality healthcare. By offering comprehensive women’s health screening appropriate for age and risk factors, illness and disease can be prevented or caught early enough to be treated effectively. Chronic disease screening and management is also an important area – managing a chronic illness well can prevent further problems and is the best way to stay healthy. Of course, prevention is key, but disease management by trained, professional NP’s is a great way to ensure future health. By creating a plan with our nurse practitioners to be proactive in your health care, you are giving yourself the best chance to stay healthy and enjoy life. HomeMD’s collaborative team of NP’s bring knowledge from a wide variety of field experience to direct patient care and use comprehensive care to diagnose, treat and prescribe day-to-day health needs, including preventive care, women’s health, pediatric practice, family health and long-term care to renal and cardiology specialties. Nurse practitioners are already the primary care providers for over 3 million Canadians which demonstrates how effective and accepted their medical expertise is in this country. HomeMD offers unlimited use of all three platforms for all of our clients. Our recently expanded coverage area due to increased demand now includes Toronto and almost the entire GTA. Clients can choose from telemedicine, a mid-town clinic visit or a home visit, depending on your needs. We encourage our clients to utilize all three platforms at any time, to determine which fits their health criteria best for a particular concern. Nurse practitioners work together with you to create a strong, trusting relationship to allow them to assess, treat and diagnose all your health concerns, with a focus on female comprehensive health. HomeMD knows that women have specialized health concerns and requirements, and our mandate is to provide quality, effective care for you and the entire family. Welcome to the next evolution of family medicine in Canada. Now serving the Toronto area, HomeMD features a powerful new app offering a unique platform designed to make your life easier and healthier. Our new software is the next step in patient-centered care. It reflects our goal to design our family practice around you, our patient, and to provide the treatment you need, with a special focus on women’s health.